Cameron Diggs was once noted as one of the best players in the country early in his high school career. He had some set backs but is ready to reclaim what's his. The class of 2016 will go down as one of the best high school classes ever when it comes to basketball and that's with no exaggeration as this years draft was a clear recognition of that. Guys like Markelle Fultz, Lonzo Ball, De'Aaron Fox, Dennis Smith Jr, etc. But would you believe me if I said Cameron Diggs had a name before any of these guys came up in the conversation? 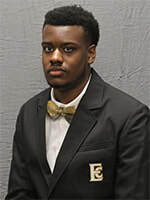 Yes it's true a kid who is starting his sophomore season at East Central Community College in Decatur, MS was considered a top 25 nationally ranked player at one point. ​Diggs was one of the top five big men in the country after showcasing himself at Clay Dade’s Junior All American Fab Frosh Camp in Atlanta, Georgia. Guys like Jayson Tatum, Bam Adebayo, VJ King, Josh Langford amongst other were in attendance with Diggs. With national scouting services like ESPN evaluating the young studs, Diggs was ranked the second best big at camp behind Adebayo. His play led to national recognition and that led to scholarship offers. High major schools such as Auburn and Seton Hall extended early offers after seeing Diggs in person early on but as his high school career kept rolling, his basketball career slowed down. His development never really caught up with his projected upside and it was more so due to his athleticism. Always known as skilled big who had guard skills, his game became limited along with his movement. All of that is now in the past but a piece of it still remains in the back of Diggs’ head as he now on re-emerging. He has been consistently put in work during the off season. After competing in Juco Report’s NCAA Live Period events in July, Diggs played well enough to earn offers from North Alabama and Virginia St while picking up interest from North Carolina A&T, North Texas, Portland, Southeastern Louisiana, Texas Rio Grande Valley and Tennessee-Martin. When it’s all said and done, Cameron Diggs will not be a 6-foot-9 “has been”. He will go on to play division-1 basketball and complete his degree. The pressure he once had on him has been lifted, he remained strong and will continue his saga.